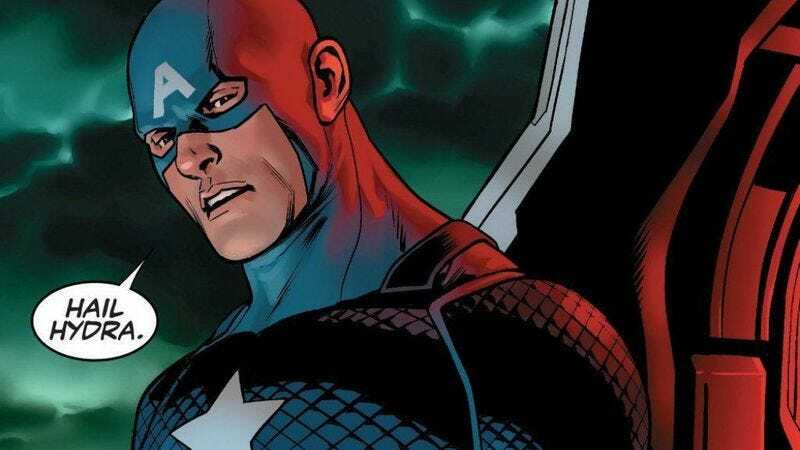 Marvel continues to face public backlash over its current Secret Empire event, i.e., the one that started with Captain America being revealed as a sleeper member of the terrorist organization Hydra, and has continued into a Cap-assisted takeover of the United States. To celebrate its big summer thing, the company has announced that it’s going to “Hydra-ize” various web sites, and even participating brick-and-mortar comic shops, handing out T-shirts emblazoned with the organization’s logo. Which would be all well and good, except for the fact that Hydra are Nazis. That’s not Marvel’s line on the group, admittedly; writer Nick Spencer has done everything in his power to distance the fictional organization from the Third Reich, insisting that Nazi-affiliated Hydra villains like Captain America’s old nemeses The Red Skull and Baron Wolfgang Von Strucker weren’t “true Hydra.” But for a number of the company’s fans, that’s little more than after-the-fact justification; Hydra and Hitler are linked, thanks to films like Captain America: The First Avenger, plus years of comics history showing the groups as being functionally intertwined. All of which means that suggesting people dress up in the Hydra logo—as opposed to groups who don’t have those same real-world connections, like D.C.’s Injustice League, or Cobra from G.I. Joe—has some, let’s say, “added” connotations, especially in a year when white nationalism is suddenly, frighteningly out in the open in America. The Daily Dot rounded up tweets and opinions from a number of fans and retailers threatening to boycott Marvel and comic shops that participated in the event, because apparently people don’t like it when big companies ask them to dress up in the regalia of groups that supported real-world mass murder. Who knew?